Express your unique thoughts and feelings, with our "Design Your Own Poem" option. Any verse that expresses what is in your mind and heart can be considered poetry. It need not rhyme and it need not be lengthy. Give a poem that you wrote to your friends and family as birthday presents and show them how special they are to you. They will be touched by your words and by your thoughtfulness. 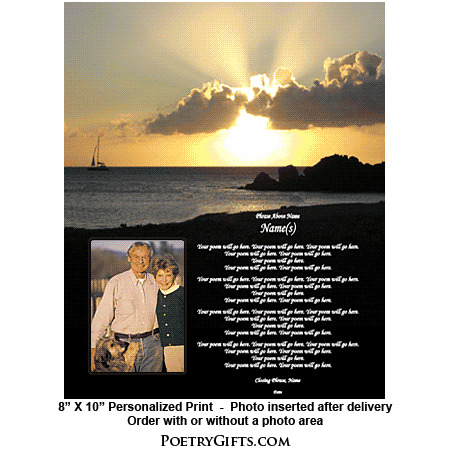 With your poem and our expertise we can help you create a one-of-a-kind personalized keepsake for your loved ones. 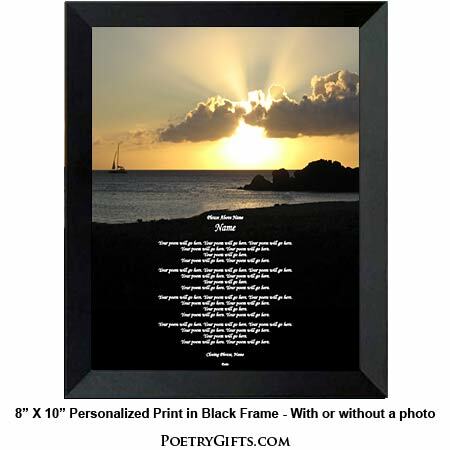 Here are some gift ideas where a poem would mean so much: birthday present for mom or dad, wedding gift for son or daughter, anniversary present for grandparents, love poem for husband or wife, a sympathy gift, an inspirational poem to encourage and motivate a friend, the birth of a new baby...you get the idea! Poetry is the perfect gift for any occasion! 3. 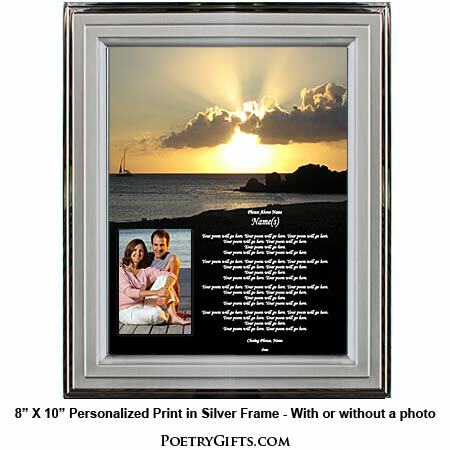 Closing Phrase and Your Name(s) (as seen after poem) - (Examples: Forever Yours, Tony; All Our Love, Mom & Dad; With Deepest Sympathy, The Panico Family; Wishing You Both a Lifetime of Happiness, Grandma & Grandpa; etc." 4.8 out of 5, Based on 10 Reviews. I ordered two poems to be framed. I love how both of them came out. In fact,I was so pleased with how the first one looked I was inspired to write another poem and have that one framed. And the turn around time was beyond expectations! They were received within about 5 days of my ordering. I would highly recommend them and will use them again in the future. This is the second time I have used PoetryGifts I was absolutely thrilled with the layout of the text I recently submitted. It made a very special gift for someone. Thank you so much! Great working with Kathy and the gift was perfect! Thank you! I loved the picture, but I was disappointed at how small the font ended up being. I realize my poem was long, but I just wish someone from the company would have called or written me to let me know how small the print was going to be. The product delivered quickly, though, so that part was great! My son wrote a peom as a retirement gift for his grandfather (my dad). It only took a few minutes to input the poem on the website and it turned out beautifully. I would use poetrygifts again. Beautiful gift and the company designed my poem perfectly. Thanks! Awesome quality, beautifully done!!!! Prompt delivery! I will definitely recommend this site to anyone looking for a really cool gift!!! The frame and setting were perfect and he absolutely loved it!!! You did a great job designing my poem. Can't thank you enough. Plan to use you again.